Don’t pack away that shovel and trowel. Fall is a great time to plant a few new additions in the landscape. Here are just a few ideas for adding immediate and long term beauty to your garden. Add cool season annuals like pansies, snapdragons, ornamental kale and stocks to brighten the fall garden. Those in milder regions will enjoy them throughout the winter. Consider adding cold hardy pansies. They provide color in the fall garden, survive most winters, and are back blooming in the spring just as the snow melts. Fall is also a good time to plant perennials, trees and shrubs. The soil is warm and the air cooler, so the plants are less stressed and establish more quickly. Select plants suited to the growing conditions and be sure to give them plenty of room to reach their mature size. Plant trees so the root flare, the place where the roots curve away from the trunk, is even with the soil surface. Dig a hole, the same depth as the rootball, and two to five times wider. Roughen the sides of the hole and backfill with the existing soil. Water thoroughly and spread a two to three inch layer of mulch over the soil surface, keeping the mulch away from the tree trunk. Follow a similar planting procedure for shrubs. Plant these so the crown, the place where the stems meet the roots, is even with the soil surface. And be sure to keep the mulch away from the stems. 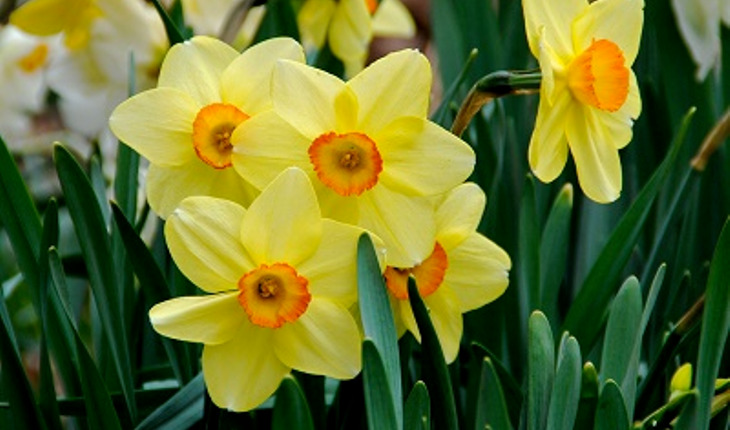 Plant daffodils, tulips, hyacinths and other bulbs in fall for extra color next spring. Set the bulbs at a depth of two to three times their height deep. Then cover them with soil and sprinkle on a low nitrogen slow release fertilizer, like Milorganite (www.milorganite.com). This organic nitrogen fertilizer promotes rooting without stimulating fall growth subject to winter kill. Start planting spring flowering bulbs after the nighttime temperatures hover between 40 and 50 degrees. Be patient – waiting until the soil cools reduces the risk of early sprouting that often occurs during a warm fall. Those gardening in the far south and along the Gulf Coast can purchase pre-cooled bulbs to compensate for the warm winters. Or the chilling can be done at home by storing the bulbs in a 35- to 45-degree location for at least 14 weeks before planting. Those tired of battling the animals may want to plant resistant bulbs such as daffodils, hyacinths, Fritillaria, alliums, Camassia, glory-of-the snow, snow drops, squills, and grape hyacinths. You may find it is easier to avoid the problem than battle the animals with repellents and scare tactics. Plant a few short season vegetables in your garden for fresh-from-the garden flavor this fall. Simply count the days from planting to the average first fall frost to determine how many growing days are left in your area. Select vegetables that will mature and can be harvested in that amount of time. Leaf lettuce, spinach, mustard greens, radishes and carrots are fast growing, cool weather tolerant vegetables that make great additions to the fall garden and your dinner plate. Get these vegetables off to a good start with a side dressing of low nitrogen fertilizer. Incorporate it into the soil prior to planting or sprinkle a narrow band along the row of plants. This organic nitrogen will provide needed nutrients without damaging the tender seedlings. Extend the harvest season with the help of floating row covers. These fabrics allow air, light and water through while trapping the heat around the plants. No construction is needed; just loosely cover the plants with the fabric, secure the edges with pipes, boards or landscape staples and let the plants provide the support. So be sure to get a jump on next spring’s garden season with a bit of fall planting now.